Having a hard time locating a good Chevy 621 bellhousing that doesn't have stripped threads or cracks? Look no further because Silver Sport Transmissions produces its own version of the 621 bellhousing. 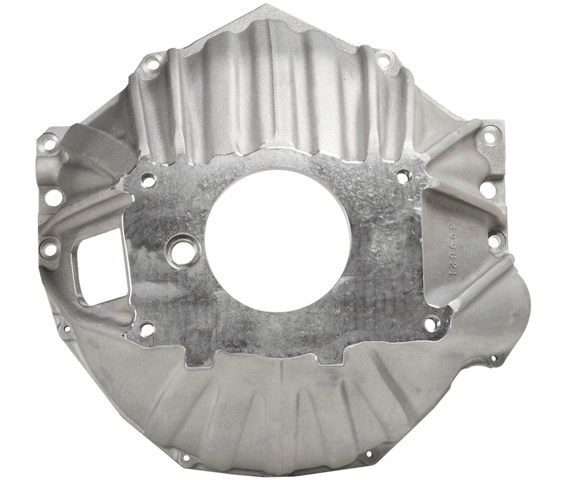 This new bellhousing is cast from thick wall titanium aluminum alloy, CNC machined to provide precise location of mounting and dowel pin holes, and the center bore that locates the gearbox. SST’s bellhousing can be used with all factory type clutch linkage parts while the design maintains its original style appearance. The bellhousing weighs 11.5 pounds, works with a factory style 168 tooth flywheel and the appropriate standard GM starter. It even includes a new inspection cover and hardware making it a seamless installation process. Uses all factory linkage parts: clutch forks, z-bar, rubber dust boot, etc. Any manual transmission sharing this same bolt pattern and input shaft length requiring a 4.685” register hole. Questions about the GM 621 Reproduction Bellhousing?